Graham Alexander believes he can still shake improvements out of his Fleetwood Town squad as the business end of the season approaches. Town remain just a point behind sixth-placed Bradford, who lost at Swindon last night, though the other three clubs in the play-off places all won to pull further clear of the Highbury club. 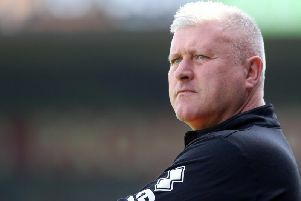 Even so, Saturday’s comeback victory over Notts County showed Fleetwood’s never-say-die spirit and it’s a superb first campaign in League One – but manager Alexander believes his side can do even better. “I’m really proud of the players,” he said. “We’ve learned a lot of harsh lessons along the way and we’ve let ourselves down at times. “But we keep trying and working hard to bring positive results. Saturday’s victory over the Magpies, secured despite a red card for Stephen Crainey, was Town’s second in three games, Fleetwood having also turned the scoreline on its head with a 2-1 win at Oakwell. And former Burnley and Preston defender Alexander believes the team spirit in the Highbury squad is starting to pay off. He said: “It’s the result of this group having been together now for 18 months. They’ve been through a lot together. “They’ve had us sticking with them, believing in them, and they also believe in each other. “When you get comebacks regularly, like we are starting to see, it’s through team spirit and camaraderie. That’s what we’ve got at this club. The Fleetwood manager made it clear it wasn’t just those regularly starting games who were playing their part. He said: “Stewart Murdoch hasn’t played a lot this season. Nathan Pond hasn’t played a lot in the last few months. “But how they work, how they train – they keep themselves right. “They’re so professional and that’s why we trust them when they go on that pitch. Stephen Crainey will be suspended for two games following his red card in Saturday’s victory over Notts County. The defender picked up two yellow cards in the second half at Highbury, resulting in his second sending-off of the season. He will miss Saturday’s trip to Chesterfield and Tuesday’s home game against Scunthorpe. Town have limited options to cover for Crainey, with Danny Andrew sidelined and Tyler Forbes a major doubt.